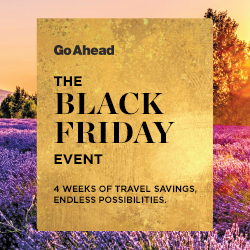 Each week of November highlights a different destination with spectacular savings, while Black Friday itself will offer enormous discounts on Go Ahead’s most popular destination: Europe. Go Ahead Tours, which offers expertly crafted guided travel experiences with the perfect balance of group sightseeing and free time for individual adventures, announced its month-long Black Friday Travel Event today. Each week of November highlights a different destination with spectacular savings, while Black Friday itself will offer enormous discounts on Go Ahead’s most popular destination: Europe. Black Friday will also feature morning doorbusters, offering additional savings for the early bird deal-seekers. The promotion will wrap up with one last offer on Cyber Monday. “The desire to travel consistently earns a spot on the list of the top resolutions for the New Year. So, taking advantage of our best prices of the year, whether as a gift to yourself or for a tour to enjoy with loved ones, is a great opportunity to ensure that this a resolution you will follow through on,”said Durflinger. For booking and additional tour information, go to https://www.goaheadtours.com/black-friday-travel-deals-2017 or call 1.800.590.1170. Go Ahead offers more than 175 high-quality guided tours across all seven continents to curious adventurers who are looking to learn more about the world and themselves. With the perfect balance of expertly planned sightseeing and free time to explore personal interests, Go Ahead trips give an in-depth look into a destination's culture—all with the ease of experienced planners working behind the scenes. As a proud part of EF Education First, Go Ahead draws on more than 50 years of expertise to continue to add meaningful travel experiences to its growing tour portfolio. EF, the world leader in international education, has helped more than 15 million people learn a language, discover the world or earn an academic degree to date.